Been at war with stomach flu and a head cold (yes, all at once) this weekend, so finally at a point where I had the energy to get up and post something. Given The Predator was granted a second trailer by the folks at 20th Century Fox, I figured I'd tackle that. The teaser for Shane Black's sequel to the 1987 action classic came out a month ago, and left a lot of people underwhelmed. I'm not sure why, or what said people expected, as it worked for me. There was action, the titular monster, and some trademark Black humour. I got what I wanted. 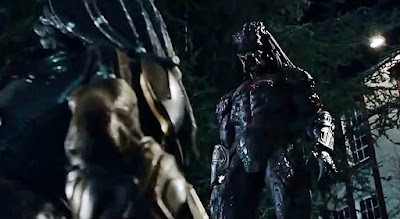 The Predator is written by Black and his Monster Squad co-writer Fred Dekker. Black also sits in the director's chair. His presence alone guarantees success to me, given his pedigree as an action writer and as director of Iron Man 3, Kiss Kiss Bang Bang and The Nice Guys. We'll know for sure how this'll turn out when The Predator hits theatres Sept. 14.